The O'Rourke campaign website touts his support for a number of new gun-control laws. On the site, he advocates a new national universal background check law, opposes national gun-carry reciprocity, and calls for additional funding for government research on gun violence. He also explains his support for banning certain semiautomatic rifles and so-called high-capacity ammunition magazines. O'Rourke spoke at length about his support for the ban at an event in February. "This is as politically charged as it comes in Texas, and this is how I hope you know that I have the courage of my convictions because I'm willing to do this," he said. "I cosponsored the assault-weapons ban. Now, I understand there are many Texans who own these AR-15s, and some of them are very good friends of mine that I've been out shooting with. And they say, ‘Beto, why are you going to prevent me from buying a gun? I haven't hurt anybody. I haven't shot anybody. I keep this gun in a gun locker. I teach my kids gun safety. How could you do this because there's some crazy, evil person in Florida or Sutherland Springs or Las Vegas or pick the next city it's gonna to happen in?' I say, ‘You know what? You're right. We have the Second Amendment, and it's incredibly important, but the Second Amendment is not unlimited. You cannot carry a bazooka down the street. You cannot drive your tank down the street because we have a Second Amendment. There's gonna have to be some rational limit to our ability that keeps more people in our communities safe and alive.'" Sen. Cruz opposes such a ban as well as a universal background check law but is a vocal supporter of national reciprocity. The Cruz campaign did not respond to a request for comment but he has received an A+ rating from the NRA while O'Rourke has received an F rating. Cruz has said O'Rourke's views are out of line with what most Texas voters believe. "Congressman O'Rourke is a vocal proponent of gun control and restricting the Second Amendment rights of law-abiding citizens," Cruz told the Dallas Morning News earlier this year. "But those anti-gun views are not reflective of the values of Texans." The O'Rourke campaign did not respond to a request for comment on whether they believe their position on gun control is counter to what Texas voters want. However, O'Rourke did admit during the February campaign stop that he is likely to face strong opposition from the NRA over his support for gun control and even said it may hurt his chances at getting elected. "Will I get the stuffin' knocked out of me by the NRA for this? Just watch it come down on us in this campaign," O’Rourke said. "But I've got to look myself in the mirror. I'm not going to answer those moms who come to my town halls and say, ‘What are you gonna to do?' and I say, ‘Well, we gotta listen and understand' or ‘we can't control this' or ‘there's just evil in the world' or ‘our thoughts and our prayers are with the parents.' We've gotta do something. And if it means we're not as viable in the election, so be it. What you want is my honest opinion on this stuff." FEC records indicate the NRA has donated just under $10,000 to Senator Cruz's campaign but has yet to spend any money against O'Rourke. 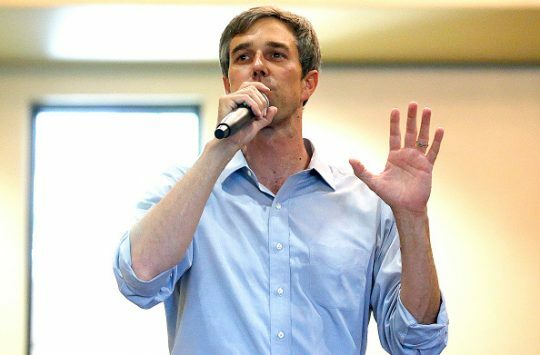 The gun rights group said O'Rourke supports the democratic leadership's priorities on guns and would vote against the interest of gun owners. "Beto O’Rourke wants voters to think he shares their Texas values, but the truth is he agrees with the D.C. elite and supports the Schumer/Pelosi gun control agenda," Amy Hunter, an NRA spokesperson, told the Washington Free Beacon. "He blames the law-abiding gun owners of Texas for the criminal acts of others and will vote against our constitutional right to self-defense." This entry was posted in Politics and tagged Beto O'Rourke, Gun Control, NRA. Bookmark the permalink.